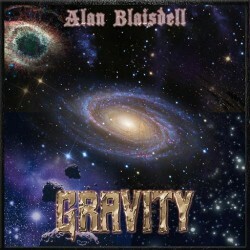 Preceded in life by the nine-track recording "The Epic", Hillsboro, Oregon' multi-instrumentalist/vocalist Alan Blaisdell (Reverse of Creation) recently-released his second solo album, the space-themed "Gravity". Along with his debut outing (which I also recommend), the tech-savvy "Gravity" can be found on places like Amazon and iTunes. For fans of (top of the shelf) melodic death metal that is more of an invitation than anything else, "Gravity" finding Alan effortlessly handling all of the instruments and vocals by himself (with extra talent to spare!). The use of electronic elements merely adds to the album's "outer space" sound (his words originally and now mine! ), but it's Alan's extreme ease with the guitar, bass, and drums that really makes this release stick out and shine. Be sure to give this one a spin. PS: Don't pay attention to the album's so-so artwork. It hides better things.